Lets Play "The Price is Right"
OK, you guys all remember Bob Barker, or if you are a little younger Drew Carey? Both were hosts of the Price is Right. Well, this is the pricing game. We were out of basics this morning and I raced down to the Auto Mercado. 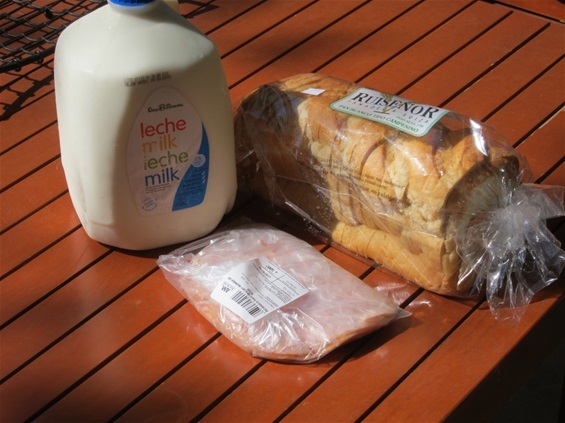 Here is what I got: 1 gallon whole milk, 3/4 pound smoked turkey breast fom the deli, and 1 loaf of bread (kind of like a sliced sour dough). WHAT DID I PAY? - Please click comment and tell me. The closest guess might just get a bag of fresh Costa Rica coffee beans. Costa Rica Expats not eligible. Yay! Joe will be VERY pleased :) I'll e-mail Nancy my parents' address since we'll be moving as of next Saturday.